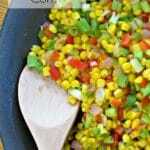 Confetti Corn is the perfect side dish to jazz up a simple dinner. It’s a great side to serve with chicken breasts, pork chops or even ham. It would even be great with hamburgers or barbecue. 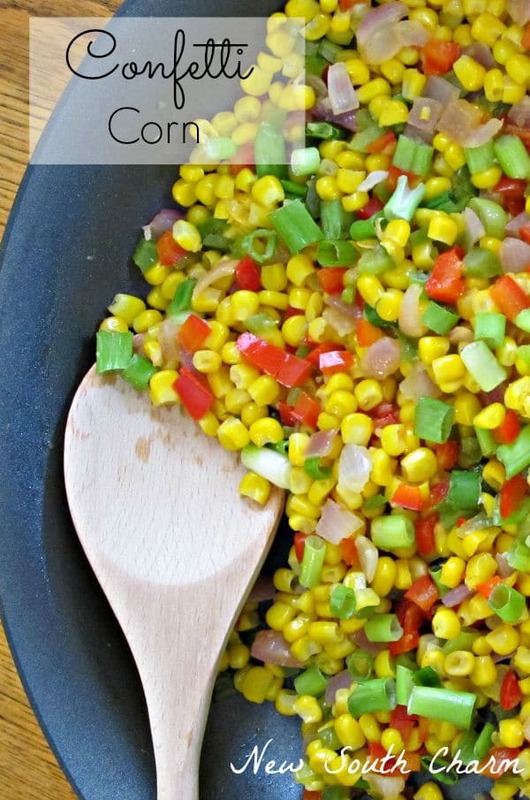 This dish is delicious with corn fresh from the cob but it’s just as good when made with frozen corn kernels. Probably like a lot of you I’m guilty of serving the same veggies on repeat. Boring. So in order to change things up some and make eating at home more fun; I’ve been trying out new recipes. Of course I’ll be sharing all the best ones with y’all. 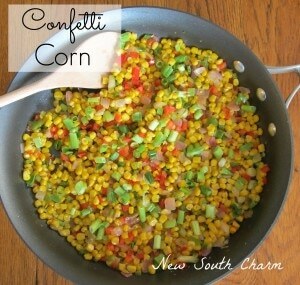 Today is one of those recipes, Confetti Corn. 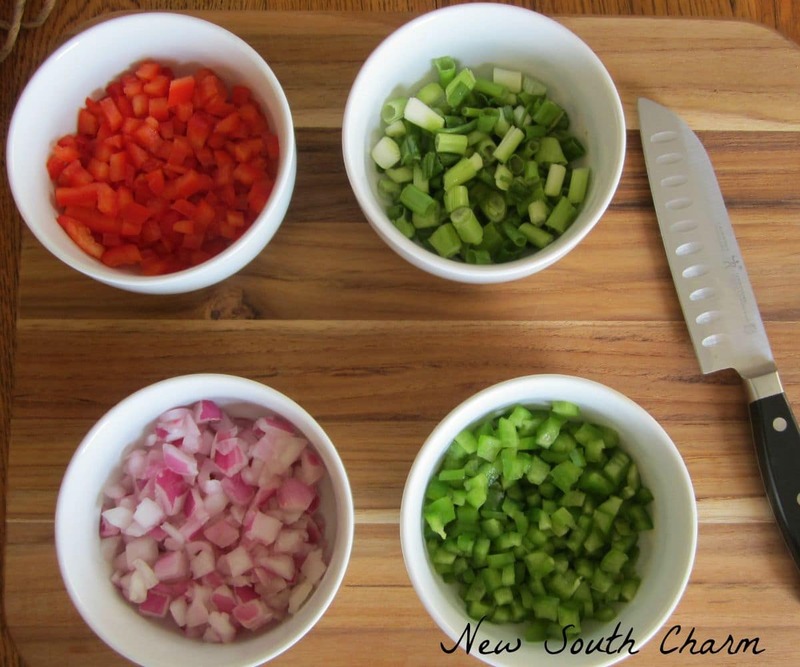 This recipe starts with chopping peppers and onions. Two kinds of peppers and two kinds of onions. Now you might be asking why two of each? Wouldn’t just one be enough, Susanne? Maybe, but you would be missing out on a lot of extra flavor. There are differences between the two bell pepper and two types of onions in this dish. Red bell peppers have a sweet flavor while green bell peppers have a slightly bitter taste.Scallions provide a light onion flavor but also give recipes texture because they are crunchy and juicy. Red onions are a little spicy and become soft when cooked. So you see each pepper and onion in this dish is adding a different to the flavor to the recipe. Thank you so much for reading! Are you following New South Charm on Facebook? I’d love to hear from you drop by and say hello! This sounds similar to the corn salsa at Chipotle or Qdoba, which I just love! How did I never think of making a big batch and just eating it with a fork?? This looks delicious! I’m visiting from Dream, Create, Inspire Linky. This sounds wonderful and is so pretty with the two types of peppers and onions! We are right in the midst of fresh corn season here in New England, I love finding new recipes featuring fresh corn, can’t wait to give this a try! This is one of my favorite posts from last week’s What’d You Do This Weekend? and will be one of my features at tomorrow’s party, I hope you will join us again! Thank you so much Joy! I love fresh corn too. I always love this time of year when there’s so much fresh produce available. Thanks for stopping by. Fantastic veggies of the summer harvest, we will just love your Confetti Corn. Hope you are having a great day and thanks so much for sharing with Full Plate Thursday. Whipped this up tonight to serve with a filet of pork. DELICIOUS. Very easy. Had all the ingredients on hand. I always have frozen organic corn in my freezer. Thanks for sharing. We love this corn. I make it all year long but I love it in the summer when I can get fresh corn on the cob. Thanks for trying it and letting me know how much you liked it! This is a great colorful dish. I love all the flavors that it encompasses.